The 2015 Glendale Glitter and Glow block party came to a close on January 10th. The annual party is a part of the Glendale Glitters holiday light display. 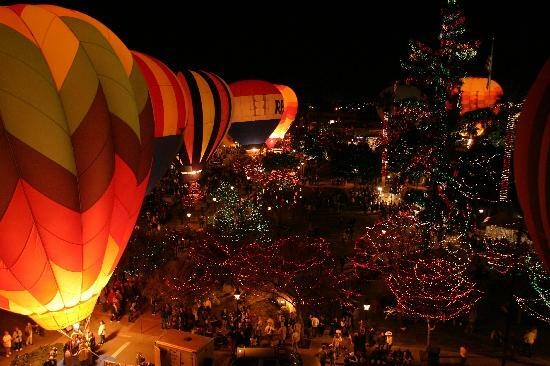 In the end, over 1.5 million lights flew along more than 20 hot air balloons. Specially shaped balloons, including Gismo the Gargoyle, made an appearance at the block party. The event covered 16 blocks of downtown Glendale, Arizona. Thousands came onto the streets to see the show and listen to live bands start 2015 out right. The Glitter and Glow block party included carnival rides, a petting zoo, and pony ring, among others. For a full list (and map) of what you missed, click here. While the closing of Glendale Glitters went smoothly, rocking the night away, a whole new party is approaching. Glendale is hosting the 2015 Super Bowl which will be held at the University of Phoenix Stadium on February 1. It’s one event after another in Glendale and hopefully the Super Bowl goes as smoothly as the sendoff of Glendale Glitters. Ford Says Goodbye to William Clay Ford Sr.
As many of you have probably already heard, William Clay Ford Sr., the last living grandchild of the company founder, Henry Ford, passed away this past Sunday at the age of 88 from pneumonia. William joined the board of directors in 1948, before he even graduated from college. He has held a position as chairman of the executive committee, vice chairman of the Board of Directors, and a chairman on the design committee, during his 57 years with the company. It is said that he had such an eye for design that he has actually picked out design flaws causing asymmetry that has only been off by an inch. At Sanderson Ford, we were saddened by this news and our thoughts go out to the family! He will be greatly missed! For the fourth time in its history, the Ford F-150 pickup has been named the 2012 Motor Trend Truck of the Year. To determine the winner of this prestigious title, the automotive experts put the nominees’ towing capability, payload capability, and performance to the test. They also judged the trucks on value, safety, efficiency, performance of intended function, advancement in design, and engineering excellence. The 2012 F-150 showed strength in each of these areas, but Motor Trend’s staff was especially impressed by the pickup’s high quality, comfortable interior, and EcoBoost engine. This innovative V6 engine produces the power of a traditional V8 with the fuel economy of a V6. Stop by Sanderson Ford today to check out our inventory of the 2012 Truck of the Year! How many people get confused about servicing their vehicles and when you should do it? Do you adhere to the 3,500, 5,000, or 7,500 mile schedule? On most 2011 and newer Ford’s, the vehicle can now tell you when maintenance is required. It’s called Intelligent Oil Life Monitoring. Now your car/truck will tell you based on the condition of the oil. Watch this video to truly understand how beneficial this is. We have had a week long tribute to Veterans at Sanderson Ford. It all wraps up Saturday with final ceremonies on Saturday morning as well as an All Models/All Makes car show that runs from 8 to 2. Drop by and see the displays that fill our large showroom. All are welcome. Please join Go Daddy on November 10, 2011, in wishing the United States Marine Corps a Happy 236th Birthday. Sanderson Ford recently donated 600 Arizona Diamondbacks tickets to Southwest Autism Research and Resource Center for patients, students, and families. We are happy to report that all tickets were used and everyone had a great time. We received this video from them as a way of saying thanks. We do appreciate all they do! Our 19th Annual All Ford Show, help on October 1st this year, was a huge success. We had over 140 cars and trucks representing 99 years of Fords on display. Spectator participation was a record this year! Here are some of the photos that were taken. Many thanks to the Wild West Mustangs of Arizona, Operation Homefront Arizona, and the Starliner Diner for making it such a success. Up next will be the Deuce Show on October 29th. See you there. We had a celebrity roast on Thursday the 25th for Neil Schrock to celebrate his 50th anniversary at Sanderson Ford. Imagine going through just about every job there is at a car dealership? He’s done it. We had about 150 guests in attendance including local media representatives and on air personalities. The event was hosted by Sue and David Kimmerle and their family in the Sanderson Village and Museum. Those roasting Neil were; Al McCoy, the emcee, as well as Mike Broomhead of KFYI, Tim & Willy of KMLE, and Todd Walsh of FSNAZ. Neil’s lifelong friend, Eldon, wife Mary, and Dave and Sue Kimmerle. The things we learned about Neil were amazing. Ask him about the GTO with 3 dining room seats the next time you see him. The Kimmerle family cooked and catered some BBQ, baked beans, coleslaw and sodas. I’ve added a photo album and here is a video provided by celebrities at Bonneville Radio. Drop by Sanderson Ford on Friday the 12th, and meet JJ Putz and Ryan Roberts from the Arizona DiamondBacks. They will be here from noon to 1pm. We will also be holding a contest for 25 pairs of free game tickets. You can watch the DiamondBacks beat up on the Mets this weekend.